1.- Adjust oven rack to middle position and heat oven to 450 degrees. Line rimmed baking sheet with aluminum foil and brush with 1 tablespoon oil. Toss Monterey Jack with cilantro and scallion greens. 2.- Pat shrimp dry with paper towels and season with salt and pepper. Heat 1 tablespoon oil in 12-inch nonstick skillet over medium heat until shimmering. Add garlic, chipotle, scallion whites, and ¼ teaspoon salt and cook until softened, about 2 minutes. Add tequila and simmer until tequila has evaporated and skillet is dry, about 5 minutes. 3.- Add shrimp and cook, stirring often, until just cooked through and opaque throughout, about 3 minutes. Transfer to bowl, stir in lime zest, and let cool for 5 minutes; drain well. 4.- Place tortillas on counter. Sprinkle half of cheese mixture over half of each tortilla, leaving ½-inch border around edge. Arrange shrimp on top in single layer, then sprinkle with remaining cheese mixture. Fold other half of each tortilla over top and press firmly to compact. 5.- Arrange quesadillas in single layer on prepared sheet, with rounded edges facing center of sheet. Brush with remaining 1 tablespoon oil. Bake until quesadilla begin to brown, about 10 minutes. 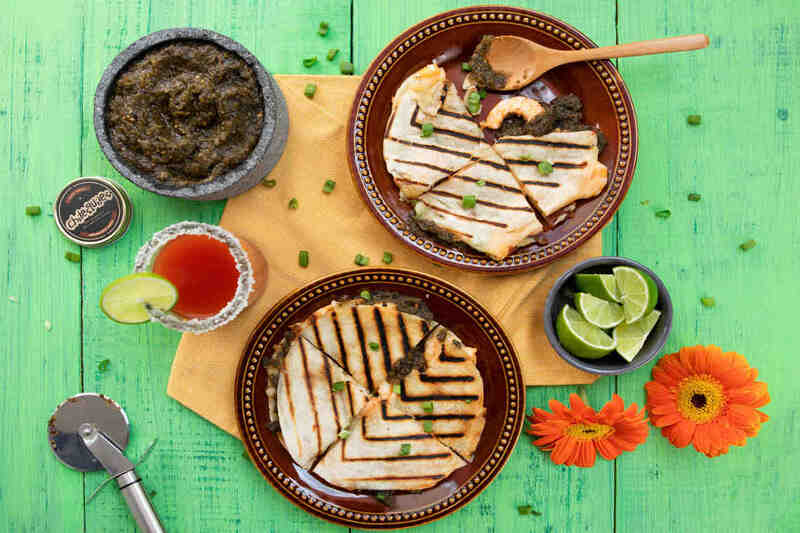 Flip quesadillas and press gently with spatula to compact. Continue to bake until crisp and golden brown on second side, about 5 minutes longer. Let quesadillas cool on wire rack for 5 minutes; slice each into 4 wedges and serve. 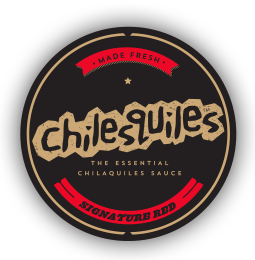 ​6.- Fill to taste with Molcajete Salsa to add that extra spicy roasted flavor .